Wy Joung Kou is an emerging queer multidisciplinary artist based in Toronto. They were recently awarded the Ontario Art Council’s Access and Career Development Grant to pursue a year long internship with Red Dress Productions as they take part in the production and mounting of Drift Seeds, a community-engaged performance piece set to be performed in June 2017.Kou has exhibited visual/tactile installation art pieces in group shows such as Project Creative Users’ CRIP INTERIORS in winter 2015 and in the second edition of the show which was featured in Nuit Blanche Toronto 2015 programming. They have been self-employed as a queer community barber and hair artist for the past 3 years, have been a self-taught jewellery maker since their early teens and have worked as an assistant artist on various public art projects with Red Dress Productions since 2015, learning ceramic and glass mosaic work in the context of participatory community art. As a chronically ill youth involved in intergenerational artist and activism platforms Kou has spoken on panels and delivered keynotes about disability Justice and youth activism at various conferences, these subjects being intrinsically linked to their identity as an artist and the work they produce. Their practice includes work in performance, writing, visual art, community based art, and disability art. 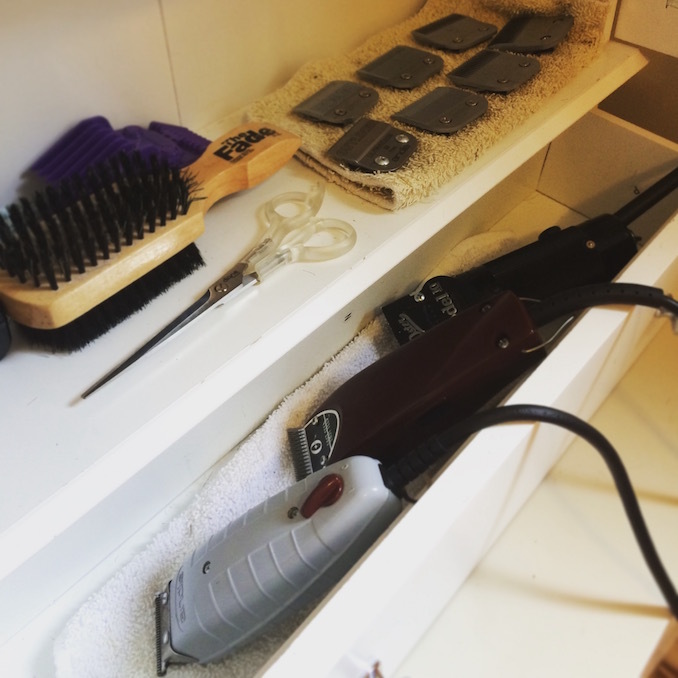 1 – My home barbershop corner; these are the tools I use to cut the hair of my beautiful queer, trans and 2spirit clients and community members – a small cabinet holds various barbering tools like shears, a brush, clipper blades, my “power tool” clippers, “fader” clippers, and “outliner” clippers. 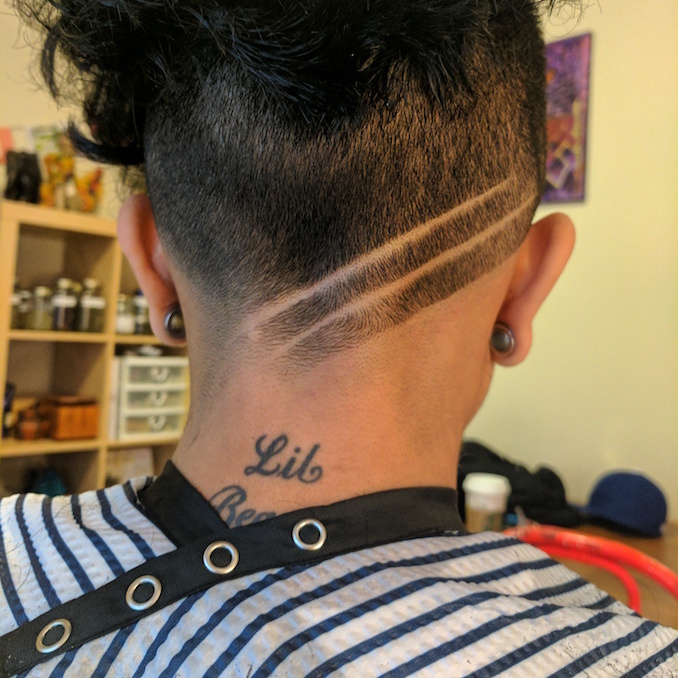 2 – This is the back of a faithful client’s head, donning my work done with clippers and a straight blade – this is a photograph of the back of someone’s head. They are wearing a white and blue striped cape buttoned around their neck. Part of a cursive script tattoo peaks out from the cape on the back of their neck. They have dark brown, almost black hair that is curly and longer near the crown of their head, with a fresh buzz on all sides and at the back of their head. Two parallel very sharp and crisp looking diagonal lines cut down from the top of their right ear to the left side of their nape. 3 – Outtake from Drift Seeds choir rehearsal! – I’m holding some sheet music for a medley song in the bottom left corner of the shot. The words “I want to be free” and lots of “ba ba ba”s are written beneath the music. 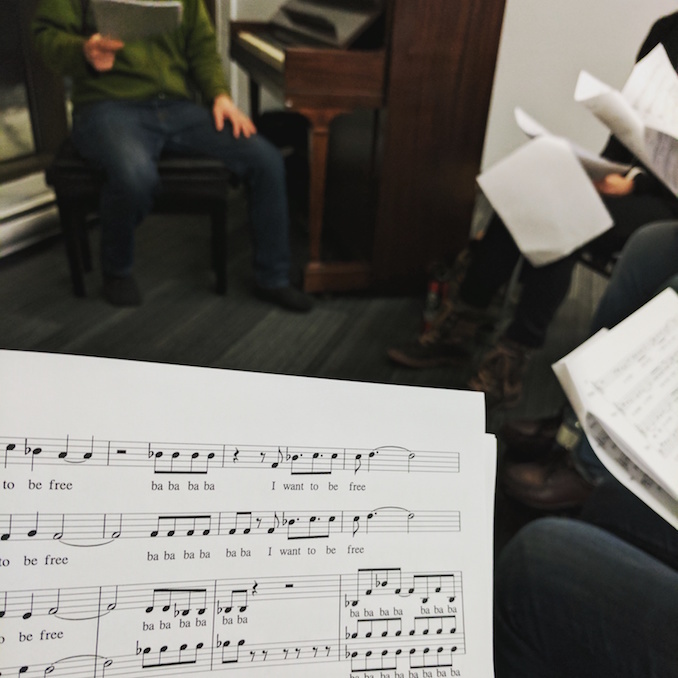 Behind the paper is a piano, our choir director wearing jeans and a green sweater sitting on the piano bench with his own sheet music in hand, and choir members to the right also holding stacks of sheet music and flipping pages. 4 – Sequin and stitch work pomegranate I created for an in-progress textile installation that will live in the Drift Seeds performance – a pomegranate has been stitched onto a tea dyed canvas tote bag with various shades of red embroidery thread. The seeds inside the pomegranate have been sewn on as red sequins. 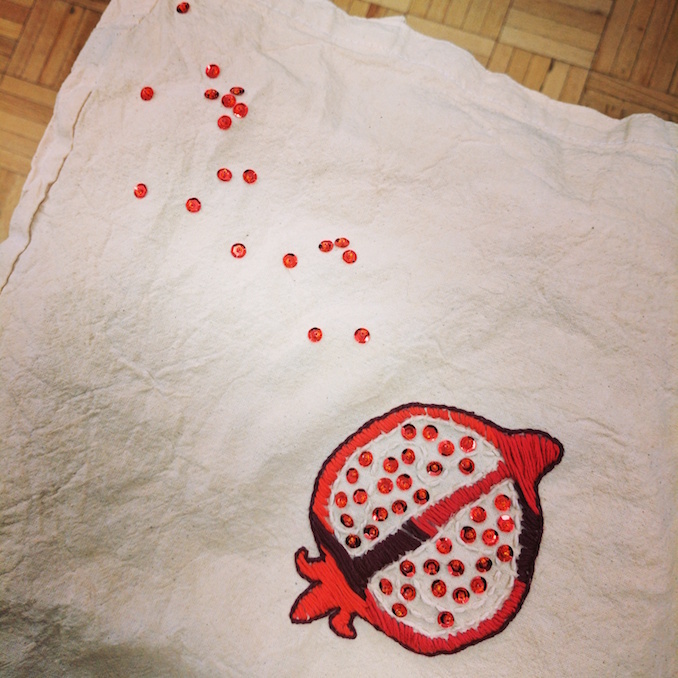 A spattering of red sequins have also been sewn on outside of the pomegranate, to the top left corner of the bag. 5 – A selfie of my life in bed as a chronically ill queer who spends a lot of time in bed or dreaming about being in bed – a light skinned person who’s face is cut out of the frame is laying in bed with their tattooed arm above their head. The sheets beneath them have an orange and blue koi fish print on them; their favourite sheets. 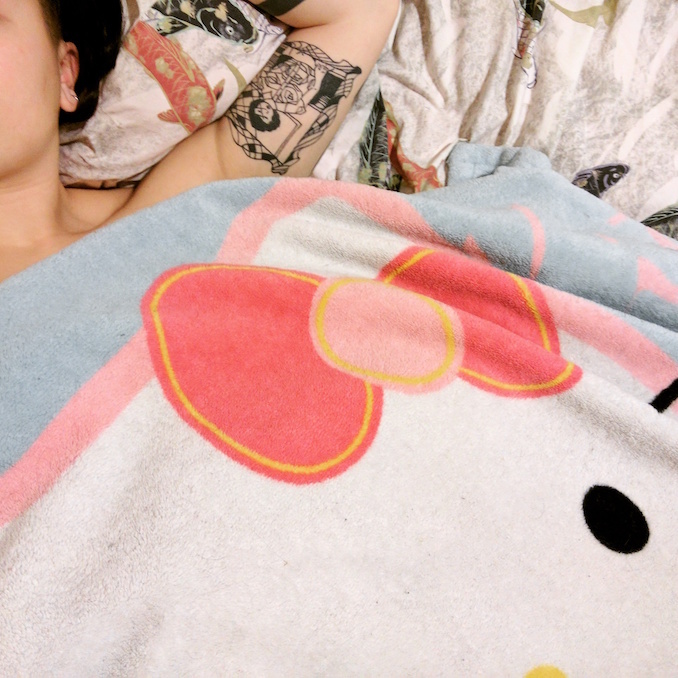 The fuzzy light blue blanket on top of them features a ginormous pink and white Hello Kitty; their favourite fuzzy blanket. 6 – The infamous Mister DimSum (aka #dumplingcat). 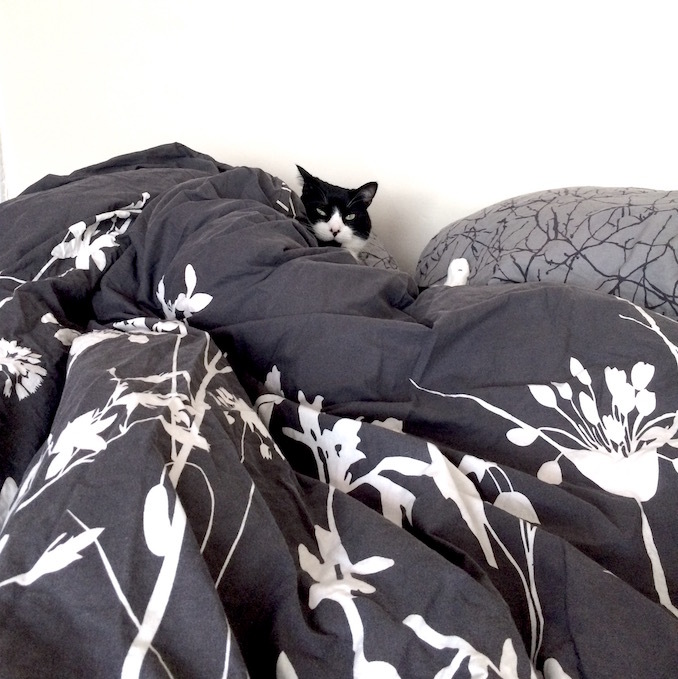 As previously stated I spend a lot of time in the sacred space that is my bed, and this guy spends a lot of time supporting me with snuggles, silliness, and play – a black and white cat’s head and one of his white back paws peak out from a mountain of grey and white floral printed duvet sheets in his human’s bed. He looks really disheveled and grumpy, like he wasn’t ready to be awakened yet. 7 – Setting intentions and gaining strength for a work-from-your-bedroom studio day with my Slow Holler tarot deck. Incorporating magic into my everyday life and my artistic practice. [image description: a light skinned hand holds up the Strength card from their tarot deck. 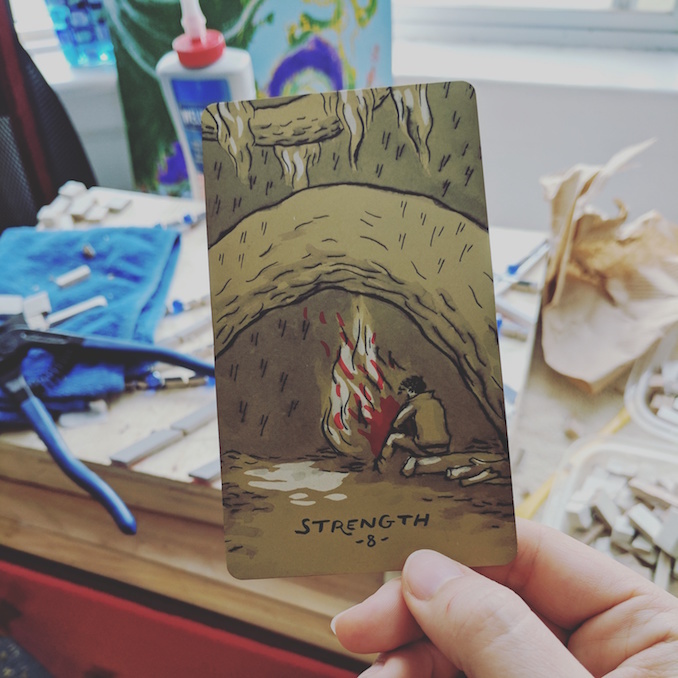 The card is mainly printed in gold and depicts a person sitting alone by a fire in a cave. Behind the card is a messy work table featuring a bottle of glue, some tile nippers, bits of white ceramic, paper towel, and a blue hand towel. 8 – A sneak peek at some new mosaic work of mine that will be displayed at Alliedoscope’s Mixed Feelings event – this is a close-up shot of mosaic work in-progress. Natural light coming through a nearby window shines off of many small blue, white and grey ceramic and porcelain pieces glued side by side and interspersed with dark blue glass beads. 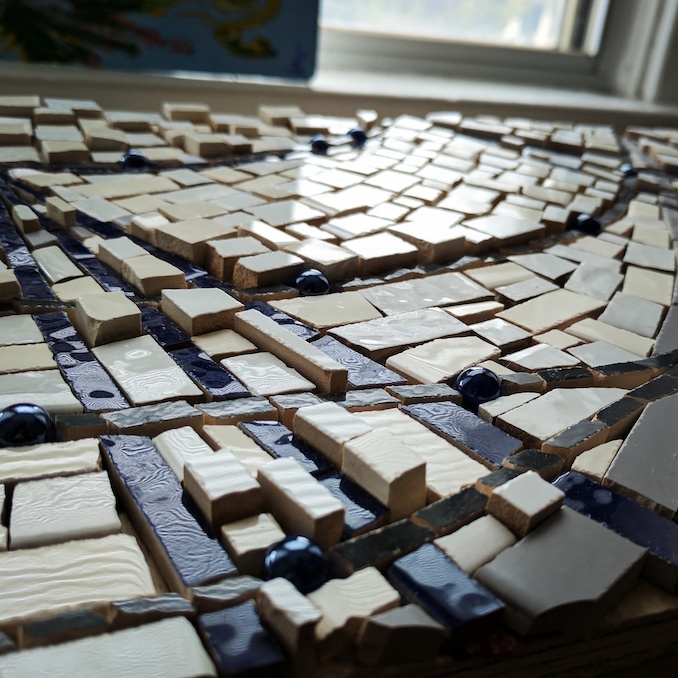 Some pieces are glossy and have a ripple-like texture glaze that catches the light very nicely, some are matte, and some pieces are thicker than others; it almost looks like a small ceramic model town with the thicker pieces sticking out like little rectangular houses, and grey and blue roads crisscrossing each other’s path. Throughout all my time in Toronto (I’ve been here since 2013) I’ve lived in either West end (Spadina St.) Chinatown or East end (Broadview Ave.) Chinatown. Living in an area where I can go out for breakfast or tea and be instantly surrounded by elder Cantonese speaking aunties with their granny carts really makes my heart feel at home here. I am multi-disciplinary, multi-hustle artist. AKA community artist, queer barber, burlesque dancer, performer, emerging mosaic artist, disability art creator and maker-of-many-things!